This article is going to go over examples for a gender reveal thank you card wording. The leftover cake is getting stale, and the balloons are deflating. You've just hosted your gender reveal party for your soon-to-arrive baby girl or boy. Gender reveal parties are a fairly new trend. According to an article on Bump Reveal, Google trends show that searches for 'gender reveal' did not rise above 0 until after the year 2010. As a fairly new trend with less than a decade of history, gender reveal parties don't have a lot of hard and fast rules or etiquette to follow. So how do you know whether or not you should write thank you notes after your party? Should I Write a Thank You Card After A Gender Reveal Party? We all know that we should write thank you cards for baby showers and gifts we receive for our new baby. Handwritten thank you notes for gifts are the norm. But do you also need to write thank you cards to the guests who attend your gender reveal party but do not give a gift? The answer, according to both etiquette and the Internet, is a resounding yes! According to Emily Post, "It's never wrong to send a written thank you." In reference to baby showers, Emily Posts also states, "The majority of people consider it rude if they don’t receive a written note of thanks even if you’ve given thanks in person." The Spruce states that "it is better to write [a thank you note] that isn't necessary than to not write one when the occasion calls for it." Most of the time, these invites express that the hosts "request the honor of your presence." The same principle, whether or not it is stated on your invitations, can be applied to any party or celebration. After all, you are not necessarily thanking guests for a gift. But you are thanking them for sharing a very special occasion with you. 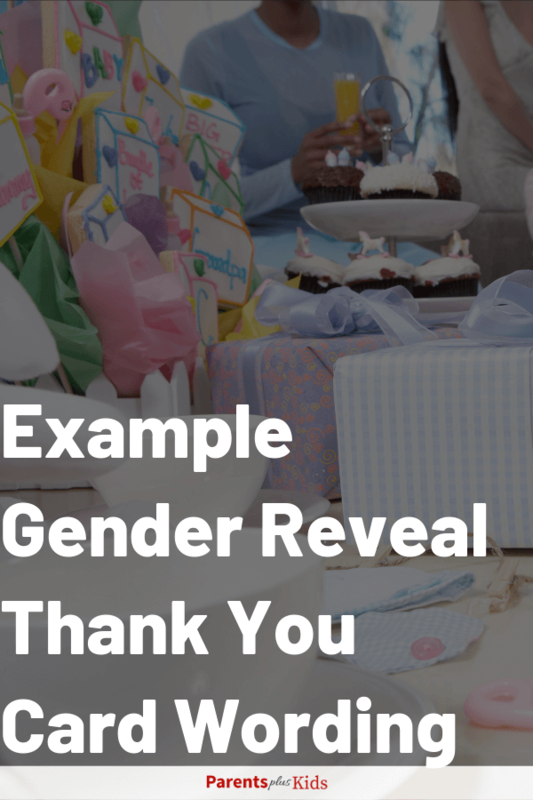 What Is The Correct Etiquette For A Gender Reveal Thank You Card? With gender reveal parties being so new, how do you know the correct etiquette surrounding them? The etiquette is still being created and written as these parties become more and more popular. A good rule of thumb is to use similar etiquette to that of writing thank you cards for baby showers, weddings and other parties. 1. Who writes the thank you cards? It may seem obvious that the mother of the baby should write the cards. However, what if the party is hosted at someone else's house? Should the party host write the cards? According to Emily Post, the mother always writes the thank you cards for baby showers. Thus, this is a good standard to take when writing thank you cards for a gender reveal party. If the host of the party also wants to write his or her own notes, that is not unacceptable, but should not replace those written by the mother of the baby. 2. When do you send the thank you cards? Thank you cards should be written and mailed as soon as possible after the party. The main reason to be prompt on this matter is that you are going to become busier and busier the closer you get to your due date. And once the baby is born, you probably won't remember to write them at all. However, another good reason to send the cards out promptly is to make sure that your guests understand how much you appreciated their presence. If you mail cards months after the event, it can feel like an afterthought to the recipients. At the very least, try to get your cards in the mail before your due date. 3. Who do you send the thank you cards to? Every single guest at your gender reveal party should receive a thank you card. Yes, even if they live with you. Further, if two guests live together but gave you separate gifts, or they each did a different service, it is wise to write them individual cards. If some guests receive thank you cards and others do not, someone is sure to feel slighted. The best rule of thumb is to send a card to every person who was there, whether they baked the cake and decorated for you, or they simply stood in a corner and observed the festivities. You may also wish to write cards to people who did not attend the party but helped you in some way. For instance, if you know the baker personally, but they did not attend the party, you should still write them a card. Have you considered those who gave you ideas for themes or the reveal itself? They should receive cards as well, even if they were not physically present. 4. What kind of stationary should you use? With only one exception, that being for wedding gifts, thank you notes can be written on any kind of stationary that you choose. Something baby-themed, of course, is ideal, but it is not necessary. You can find many baby shower thank you cards that will work equally well for gender reveal parties. Other cards that work well are spring themed, Easter themed or generic thank you cards. The bottom line is simply to choose cards that you like and would like to receive yourself. Now that you know who should write the cards, when to send them, who to send them to and what kind of stationary to use, how do you know what to say? How Do I Write A Gender Reveal Party Thank You Card? Many people find writing thank you cards to be an intimidating task, no matter the occasion. But writing thank you cards for your gender reveal party does not have to be an ordeal. 1. Determine what you are thanking the guest for. Begin with a list of names. Beside each name, write down what you need to thank that guest for. Most of the guests may only need to be thanked for their presence. However, some guests will have brought gifts or provided other services to you for the party. Perhaps one of your guests baked the cake. Maybe someone else helped you clean the house before the guests arrived. Jot these services down next to their name so that you can streamline your card-writing more easily. 2. Write a heartfelt message that is unique to each guest. Each message should address the guest by first name. You may begin with the greeting, "Dear--" if you feel that it is appropriate, but you don't have to. You may simply write their name followed by a comma. If a guest gave you a gift, or if they performed a service of some kind, be sure to thank them for that and name the gift or service specifically. This shows your guests that you remember what was done by whom, and you are not simply writing generic cards to get them done as quickly as possible. If you're still not sure where to start, or how to word something, here are some sample thank you card texts that you can use as inspiration. Thank you so much for attending my gender reveal party and for helping with the decorations. I couldn't have done it without your tireless efforts. I am saving one of the cute bunny balloons and a streamer to put in my baby photo album once he arrives! I appreciate all that you did more than I can say. My gender reveal party was a roaring success, and I could not have done it without you! Thank you so much, both for attending and for baking the adorable jungle themed cake. Everyone said the cake was as tasty as it was cute, and I even got some requests for your information. I made sure to get some great photos of the cake, and saved one of the giraffe cake toppers, so that I will have a memory of it to treasure forever. You are the sweetest friend. Thank you for all that you did. I cannot thank you enough for covering the distance to get to my gender reveal party. I know that you had a long trip, driving all the way from Cincinnati, and I was beyond happy that you decided to make this day even more special for me with your presence. It was a really fun party, and I will always remember the way _____ fell over when he took a swing at the piñata! What a laugh. I'm excited for my baby girl to someday meet you both. You add so much joy to my life. Who says baby parties are only for women? I was so happy that you came to my gender reveal party! As the only male attendee, you bucked the trend, and that means a lot to me. I also wanted to thank you for the adorable plush cat you brought. It's so soft and cuddly. I also really love that it has a lavender scent. I am positive my baby boy will find much comfort in this soothing toy over the years. Thank you for being such a fantastic cousin! We love you very much. I cannot thank you enough for all of your help putting together my gender reveal party. Your help with cleaning saved me so much hassle. The work you did on the kitchen alone was incredible. I had been putting off those dishes for far too long, and the way you rolled up your sleeves and buckled down on them like it was nothing at all still makes me smile. You are a wonderful friend, and I am so glad that you were here for me, both as a guest and as a helper. I was so sorry that you could not attend my gender reveal party, but I wanted to thank you for the fantastic idea you gave me for the jungle theme. I will be putting photos on social media soon so that you can see how it all went down. We all hope to see you soon after baby Alice is born. Don’t forget to share this article so we can help other soon to be parents.